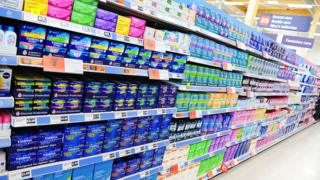 Women and girls from low income households in parts of Aberdeen are to be offered free sanitary products. The Scottish government's pilot project has been designed to tackle "period poverty". The move has been welcomed by anti-poverty campaigners, including Ewan Gunn, of The Trussell Trust. He said there are women and girls in Scotland who use newspaper or toilet paper instead of tampons or towels because they cannot afford to buy them. It follows a growing campaign demanding "dignity" for women whose budgets do not stretch to sanitary protection. The pilot scheme will be led by Community Food Initiatives North East social enterprise and it has been launched by equalities secretary Angela Constance. Mr Gunn told BBC Radio Scotland said period poverty was a "very real, very pertinent issue" in Scotland. "For me personally, it really came into focus for me a few years ago when a young girl came into the food bank I used to run in Dundee.," he told the Good Morning Scotland programme. "She refused feminine hygiene products purely on the basis that she hadn't had a period for a number of months due to malnutrition." He said he would like to see universal provision of sanitary products for women and girls. "It's something I would hope every woman and girl has access to," he added. "We've taken evidence across the country of women who supplement that by the use of socks, they would use toilet paper and in some of the worst circumstances, I've come into contact with women who supplemented that by the use of newspaper. "It's literally as grave as that." He added: "Schools and colleges will provide condoms for something that you can abstain from, but you cannot abstain from having your period. We need to find a way that we can provide for this issue right now." Equalities Secretary Ms Constance said: "It is unacceptable that any woman or girl in Scotland should be unable to access sanitary products. That is why, as part of our wider aims to eradicate poverty from our country, we are exploring how to make products freely available to low-income groups. "The pilot in Aberdeen is a first step to help us understand the barriers women and girls face - and to help us develop a sensitive and dignified solution to making these products easily accessible to those who need them." Labour MSP Monica Lennon, who has been campaigning on the issue, called for the government to go further. She said: "I'm pleased the campaign I have started as an opposition MSP has pushed SNP ministers to act, but the reality is that women and girls urgently need national action now. "A pilot scheme is a welcome step in the right direction, but we must go much further to help women and girls across the country who are facing a monthly struggle to access the products they need. "After relentless austerity over the last few years from both the Tories and the SNP, there are too many women and girls in Scotland who are unable to afford essential sanitary products during menstruation due to poverty. "We need to end period poverty and improve access to sanitary products right across Scotland and that's why I will soon be launching a consultation on a Member's Bill proposal which will give all women in Scotland the right to access these products for free, regardless of their income."